Dust off and pack up those unused wedding gifts and impulsively purchased gadgets. The key to organizing a small kitchen is removing unnecessary items and creatively housing essentials. Utilize every possible inch of a small kitchen by organizing storage spaces and clearing counter tops. Use floors, ceilings and walls to support additional storage solutions. Avoid over-packing cabinets so you can easily access items. Sort through food items in cabinets and closets. Dispose of expired food, place food that will not be eaten in a donation bin, and temporarily place all other nonperishable food in a box or on the floor. Remove appliances, utensils and dishes from cabinets, closets and drawers. Dispose of, donate or sell any items of which you have duplicates or no longer use. Line other items on the floor or in boxes, ordering them based on frequency of use. Gather cookware and bake ware from current locations. Remove lids and stack pieces that came in sets. Divide your cookware and bake ware into two groups: pieces you frequently use and pieces reserved for special occasions or meals. Remove and relocate misplaced items found on counter tops. Place items that should be stored elsewhere in the kitchen on the floor or in boxes near other items they go with if applicable. Clear unnecessary items from shelves, cabinet tops, tops and sides of refrigerators, and any other spaces where items are stored. Place items belonging elsewhere in the kitchen on the floor or in boxes, near similar items if possible. Install space-saving products in cabinets, closets and drawers. Roll out baskets attached to closet shelves allow for more efficient use of space and less clutter, according to Elaine Bloom in an article titled "How to Organize a Small Space" on Apartmentscom. Bloom also recommends securing a rack onto the back of closet or cabinet doors in which to store cookware lids or spices. Dividers allow for more organization when you must utilize every bit of drawer space. Place food items you would like stored in closets, cabinets and drawers into their respective locations. 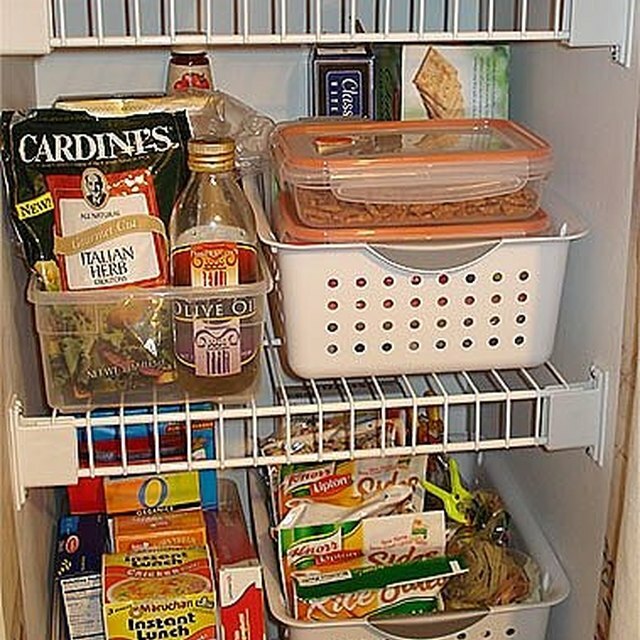 Position infrequently used foods toward the back of storage compartments, and utilize the space-saving products to compactly group items. If food is packaged in unnecessarily large containers, transfer it to smaller canisters or bags. Replace all the utensils, dishes, appliances, bake ware and cookware that will fit comfortably in remaining cabinet, closet and drawer space. Stack items when possible and place your most frequently used items in accessible locations, with infrequently used items placed toward the back of storage areas or on high shelves. Replace bulky appliances with smaller versions or products that can be mounted underneath cabinets or on walls. This frees up counter space. Purchase a crock to hold your favorite cooking utensils and keep it on the counter near the stove. This conserves drawer space and keeps your tools nearby while you cook. Place other frequently used items on the counter. Position them logically. For example, place a knife block near your cutting board and a drying rack near the sink. Purchase shelves on which to place items that cannot fit in other locations. Shelves may be mounted on walls or in cabinets. You may purchase shelving units and push them against walls or the side of your refrigerator. Hang pots and pans from a rack positioned on the ceiling near your oven. Place your most frequently used pieces on the rack. Store extra dishes, cookware and bake ware in a china cabinet positioned on your floor or mounted on a wall. Re-purpose an armoire to store kitchen supplies when cabinet space is limited. Large and awkwardly shaped kitchen items, such as cookie sheets and pizza stones, fit well in armoires once the clothing rods are removed, according to Bloom. Place similar items, such as baking tools or an extra set of silverware, in baskets or bins. Store them on top of your refrigerator, on top of cabinets or shelving units, or underneath the lowest closet shelves. Place magnetized hooks on your refrigerator to hold pot holders, paperwork, recipes and aprons. "Redbook": My Kitchen is Cluttered. Help! Where Should You Store Oven Mitts and Pot Holders?